The last AMD announcement for today is the new x86 Piledriver CPU refresh which includes the FX-8370, FX-8370E and FX-8320E processors. The new FX CPU refresh comes four months after Intel launched their very own Haswell Refresh lineup which includes the Devil’s Canyon processor. 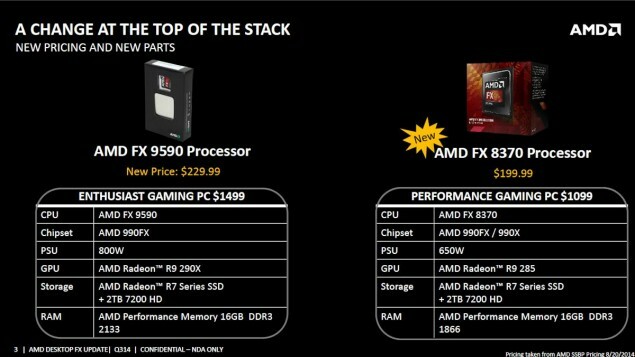 Rather than focusing on performance, AMD targets Intel with their brute pricing model which offers users a 4.4 GHz clock chip with 8 Cores at a low price of $199.99 US. Back at the Radeon event held last week, AMD demonstrated a live overclocking preview of the FX-8370 processor where renowned overclocker “Chew” from Xtremesystems overclocked the chip past 8 GHz and even got to see a overclock world record of the FX-8370 a few days from overclocker “The Stilt” who had the chip clocked at an impressive 8.7 GHz on liquid nitrogen cooling. The show detailed nothing else regarding the FX processors but we already had received information on the new refresh chips prior to event so let’s do a quick run through of what we are looking at today. Let’s get started with the FX-8370 now which will become the flagship x86 Piledriver processor of the original FX-8000 lineup until AMD plans to launch a new processor line (hopefully no refresh). 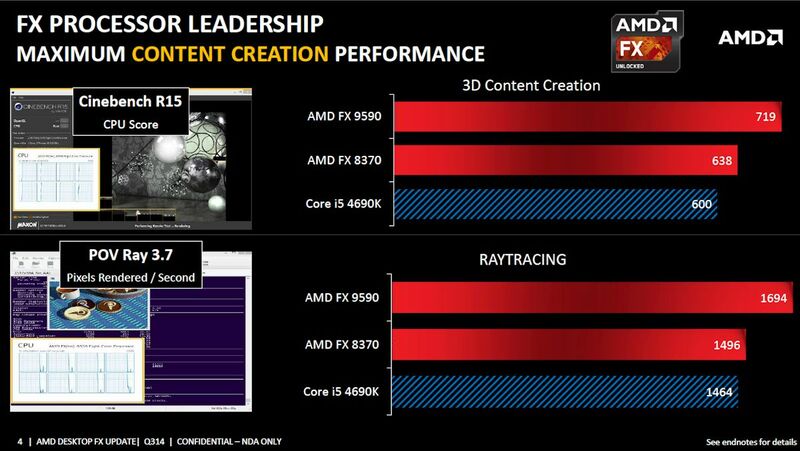 AMD does have steamroller but they aren’t focusing it towards the high-end desktop market instead focusing it towards the APU market with their Kaveri APUs and Athlon processors. 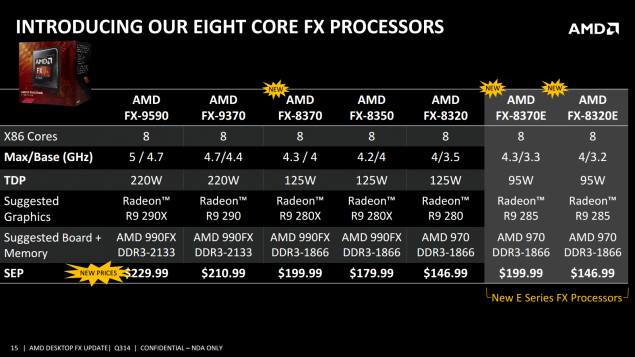 The FX-8370 is clocked at 4.30 GHz base and 4.40 GHz boost clock and ships with a 8 MB L3 cache, 8 cores. 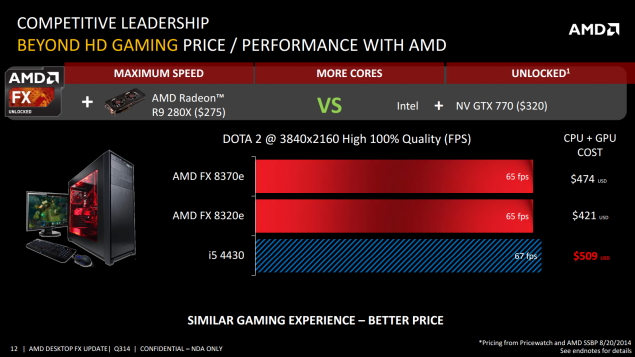 125W TDP and a price of $189 US. The FX-8370E on the other hand has the same specifications aside from the 3.3 GHz core and 4.3 GHz clock speeds maintaining a TDP of 95W. 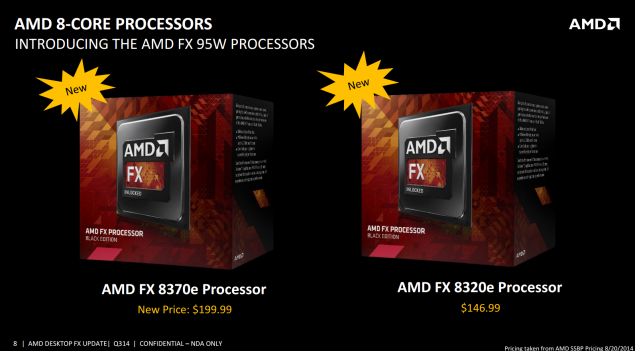 Both the FX-8370 and FX-8370E are priced at $199.99 US. Next up, we have the FX-8320E which is an optimized FX-8320 with a core clock of 3.20 GHz, turbo clock of 4.00 GHz, an 8 MB L3 Cache and a 95W TDP. The processor is priced at $146.99 US. Finally, we have the FX-8300 which was introduced in the Chinese market which comes in at a 3.30 GHz core and 4.20 GHz boost clock followed by a 8 MB L3 cache, a 125W TDP and a price of around a 120 US dollars. With new chips and price cuts, AMD will try to gain some market share away from Intel’s Haswell line of processors. The recent 8 core offerings under $200 US seem good against the Core i3 and Core i5 lineup but enthusiasts still prefer to go for the Intel route when spending more than $200 US with processors such as the Core i5-4670K, Core i5-4690K, Core i7-4770K, Core i7-4790K and even the latest G3258 Pentium 20th Anniversary edition which is a good choice for budget users. 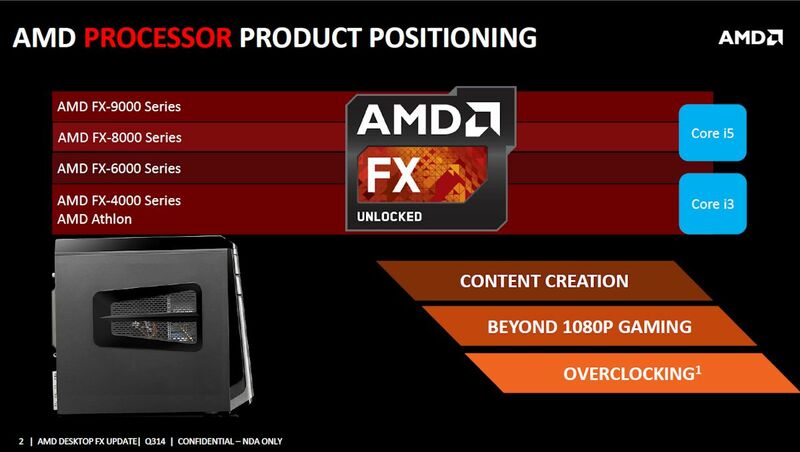 AMD has also adjusted their price model for their entire FX-8000 series lineup with the FX-9590 now coming in at $229.99 US (Liquid Cooling Bundle) and the FX-9370 coming in at $210.99 US (Liquid Cooling Bundle). The long running FX-8350 can be bought at a low price of $179.99 US while the FX-8320 retails for $146.99 US. The recent new comer, the FX-8310 is down to just $129.99 US. On the FM2+ side, the Athlon II X4 860K, Athlon II X4 840 and Athlon X2 450 processors are coming out to the market soon.The steamroller based Athlon II X4 860K Quad Core chip features four threads, 3.7 GHz clock speed, 2 MB L2 cache and a 95W TDP. The boost clock is not known but considering the A10-7850K which is also a 3.7 GHz clocked chip jumps to 4.0 GHz in boost mode, we can see a similar boost clock for the Athlon X4 860K. The Athlon X4 840 is a quad core processor featuring a 3.4 GHz clock speed, 2 MB L2 cache, 95W TDP while the Athlon X2 450 is a dual core steamroller based processor of which details are not known at the moment. 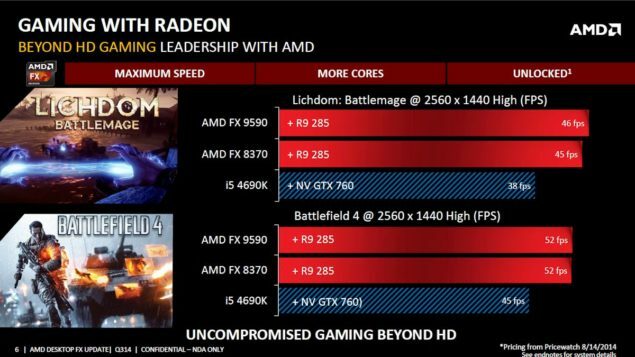 In addition to these, AMD also has two AM1 chips planned for launch which include the Ahtlon X4 550 and Athlon X4 530 processors based on the updated Jaguar architecture codenamed Puma.